Jodi Picoult addresses the Princeton University Class of 2016. Photo: Denise Applewhite, Princeton University Office of Communications. Best-selling novelist Jodi Picoult told Princeton University seniors Monday how she became an accidental activist when she was a student. Picoult, who said she never had to fight for anything growing up in suburbia, described her first day in a creative writing workshop at Princeton. Her teacher, Mary Morris, handed her construction paper, scissors and a glue stick, and told her to sit on the floor, surrounded by the rest of the class. The teacher ripped up the first four pages of Picoult’s short story, and told her to spend the rest of the class cutting and pasting. “I left in tears. The next day, I went to Mary’s office hours and asked why she’d done that. ‘Because you needed it,’ she told me, ‘and because you can take it.’ Well, I was so angry that I edited that story. And edited it. And edited it. And then I sold it to Seventeen magazine,” she said. 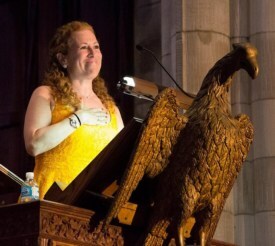 Picoult, who graduated from Princeton in 1987, was the keynote speaker for Class Day, the annual, lighthearted ceremony organized by seniors that is held the day before graduation. Students are recognized for their achievements, and the class names honorary members. Joking about posts on social media regarding her Princeton visit, Picoult said the Class Day speaker could have been worse — “It could have been Ted Cruz.” She also recalled how she became the first woman manager of the men’s crew team at Princeton. “At first, the guys didn’t know what to make of me, until they realized that I was the smallest person on the team, and then everyone wanted to sit with me on long bus trips,” she said. Picoult said after she graduated, she continued to push back, and resisted being defined as a writer of women’s fiction. In 2010, she caused a stir when she tweeted about how a Jonathan Franzen novel had landed two reviews and a profile piece in a single week in the New YorkTimes. “Would love to see The New York Times rave about authors who aren’t white male literary darlings,” she tweeted. She and other women writers like Jennifer Weiner were criticized when they continued to point out that there is gender inequity in publishing. “We were told to stop whining, to write better books, to write about subjects that were as important as those covered by men writers. We were told we were wrong,” she said. An organization called VIDA then looked at data and proved that male authors are reviewed far more frequently than female authors, even though 80 percent of books are bought by women. “Seven years later, I’m still a thorn in the side of the publishing industry, because I won’t stop talking about gender and racial equity. Yeah, I get flack for it. But if even one reader chooses a female writer because of something I’ve said, isn’t it worth it?” she asked. Picoult said she wrote “My Sister’s Keeper” after one of her children had 13 surgeries in three years. In the book, she looked at the question of whether parents love all their children equally. She wrote “Sing You Home” when her eldest son came out, and explored how to make the world a safer place for gay men. In her upcoming novel, “Small Great Things,” she explores what it means to be white, and to realize that the color of her skin has given her advantages she previously attributed to luck or hard work. She described the hostility some women faced when they attended Princeton back in the late 1960s and early 1970s, and then said she hopes men have come to see the benefits of coeducation. “Yet, in the 15 years Princeton has had Class Day Speakers from outside the university, I am only the third female. I mean, clearly there is a dearth of talent. It’s not like Elena Kagan went to Princeton. Or Sonia Sotomayor. Or Anne Marie Slaughter. Or the First Lady of the United States,” she said. Picoult added that the road to defining a community is historically bumpy, and that acceptance does not guarantee inclusion. She called on people with power to recognize their privilege and speak up for the voiceless.